Anywhere you travel, you stand a good chance of needing a pocket knife, a flashlight, or both. The Classic set from Victorinox Swiss Army provides both, plus several other good tools most of us would otherwise leave behind. 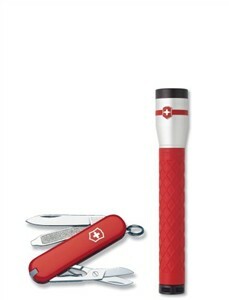 Swiss Army's Classic knife may be only 2-1/4 inches long when folded, but this red-handled high carbon stainless steel tool set packs a small and very serviceable plain-edged, spear point knife blade. Not only that, there's a file good enough for fingernails, or a little emergency metal working, and a pair of small shears. I prefer the blade for most things, but the shears have come in handy for tidying up smaller medical emergencies like blisters or torn finger and toe nails. The tiny pair of tweezers in one of the handle slots has pulled out many thorns and splinters, and the plastic toothpick is surprisingly durable and useful. The Classic's small size makes it acceptable in many places where my favorite Buck 101 would raise eyebrows. The companion piece is one of Victorinox's new LED emergency flashlights. This lightweight model runs for more than 3 -1/2 hours on two AAA batteries and beams a light ten times brighter than the old incandescent bulb lamps. The light illuminates objects in detail up to 125 feet away, and if you need an emergency beacon, the light is easily visible as far as a mile and a half in good viewing conditions. The red rubber coating on the lamp's case gives you a solid grip you won't lose in the dark and the cold. The set of lamp and knife comes in a pre-packaged gift tin. If you don't need the flashlight, the Swiss Army Classic pocket knife is a great choice for countryside or city and is available separately.